Over the years, I have bantered with the Espinal Adler Team (Marie Espinal and Jeff Adler) at Douglas Elliman Real Estate about the market which has been invaluable for on the ground intel. And we’ve become friends. When Jeff and Marie asked me to be formally interviewed for their blog “The Apple Peeled” I was happy to do so, especially because I could veer off the road into issues about the current mortgage and appraisal process. This “The Apple Peeled” blog post: Ask the Experts: Market Dynamics with Jonathan Miller was distilled from the 90-minute conversation (I could have gone on for 5 hours) I had with their team. The number of units sold in Manhattan in 2018 was down by more than 14 percent compared to the previous year. The brokerage industry tends to be very linear in its perception of the market, so many believe when the market is rising, it will rise forever. And, in-turn, when the market falls, it will fall forever. That approach can lead to overreaction. Some analysts are even comparing the current cycle to the last downturn and the housing bubble in 2009, but Miller outlined quite a few differences between then and now. In 2009, the average discount from listing was 10.2%. In 2018 the discount was 5.2%. In ’09, Miller said sellers were anchored to the “pre-Lehman, pre-financial crisis asking prices” and had to travel farther on price to meet a buyer. (Miller measures listing discount by the percent difference between the contract price and the price that the property was listed for sale at the time of contract – not when it was first listed). The most recent asking price is “really the moment the property entered the market,” he said. Miller said there are more buyers today compared to 2009, but those buyers are “very jaded about what value is.” Meanwhile, sellers are anchored to another market completely, he said. The change in tax laws in 2018 and a several-month stretch that saw mortgage rates rise before recently dropping close to previous levels had both buyers and sellers re-calibrating what value is. That process can take time. For the last two years, Miller has said that the NYC market is softer at the top and tighter as you move lower in price. Overall inventory is up by about 17%, with a significant amount of supply coming from the studio and 1-bedroom market. Studio inventory is up 21% percent. Typically, rates rise when the economy is strong. The low rates we’re seeing today understate the strength of the current economy, according to Miller. “That’s the disconnect.” In the long run, interest rates do not impact price trends. Mortgage rates have trended lower for three decades, Miller said, but housing prices have fluctuated up and down during that same lengthy stretch. Mortgage rates weren’t wildly different in ’09 compared to today. In a recent report, Miller stated that an adjustable rate mortgage rate averaged 4.38% in 2009 and was at 3.98% using the same metrics in 2018. “There was nothing learned from the bad behavior of a decade ago,” Miller said, reminding himself of a Mark Twain quote. “History doesn’t repeat itself, but sometimes it rhymes,” Jonathan Miller recited. Miller, President and CEO of real estate appraisal and consulting firm Miller Samuel Inc., said federal regulators are acting irresponsibly in their effort to reduce and perhaps even eliminate the need for an appraisal as part of an overall effort to erase “friction points” that slow-down the mortgage application process. Miller said the regulators were more concerned with collecting fees than they were with protecting the American consumer. He likened the subtle de-regulation to the housing bubble of a decade ago, pointing out that regulators were getting paid by the failing investment banks they were rating back then. Now, he said, regulators and both Fannie Mae and Freddie Mac are getting paid whenever loan volume passes through those agencies. (Fannie Mae and Freddie Mac are Government sponsored enterprises that purchase mortgages from banks and mortgage companies in an effort to create liquidity so that lenders have the capacity to lend to more homebuyers). The Office of the Comptroller of the Currency (OCC), The Board of Governors for the Federal Reserve System, and the Federal Deposit Insurance Corporation (FDIC) proposed a rule to amend the agencies regulations requiring appraisals for certain real estate related transactions. The proposed rule would increase the threshold level at, or below which appraisals would not be required for residential real estate-related transactions from $250,000 to $400,000. In response to our request for comment, spokespeople for the FDIC, the OCC, and The Federal Reserve said they do not comment on proposed rules during the rulemaking process. The push for fewer mandatory appraisals isn’t the only thing that has hurt the appraisal industry since the Dodd Frank Act was passed in 2010. The evolution of the mortgage industry’s use of the Appraisal Management Company (AMC) has led to a collapse in quality of appraisals ordered by banks, Miller said. He described the AMC as an institutional middle man that takes more than 50 cents on the dollar away from the professional appraisers who do the actual work. The AMC is supposed to act as a communication barrier between the appraiser and the loan officer or mortgage broker, to thwart undue pressure to bring appraised values in at specific numbers. But according to Miller, the AMCs are under the same types of pressure that an individual appraiser might face. Some AMCs receive hundreds of thousands of dollars every month by way of appraisal orders placed by big banks. At least at the sales level, the banks apply pressure to the AMC to not “kill deals,” said Miller, who has testified in several class action lawsuits against AMCs. In many instances, Miller and his firm were hired to do sample reviews of appraisals that came through AMCs. Often, the AMC would utilize appraisers in the market that would always “hit the number,” Miller said. A lot of those appraisers were ignoring valid comps, sometimes from directly across the street that were virtually the same as the subject property. “The AMC encouraged it because they were getting the work,” he said. Appraisers are pushing back and there are already signs that AMCs were beginning to crumble, Miller said. Quality appraisers are turning away bank work when they know the order is coming in through an AMC because they’re not happy working for less than they deserve and because they’ve been reduced to “form-fillers,” Miller said. David Stevens, CEO of the Mortgage Bankers Association was annoyed at the public outrage. Even the Urban Institute’s Laurie Goodman who is another voice of reason, writes a blog post on Why Rocket Mortgage won’t start another housing crisis. I am one of those who were angry after seeing the QL commercials that aired before the Super Bowl and my disbelief continued after watching the Super Bowl ad. I lived the insanity and the QL commercial was completely tone deaf and gave me great concern about repeating mistakes in the past. In fact I was so concerned that I made the QL Super Bowl commercial the cornerstone of last week’s Housing Note: Rockets Engineered to Amaze Housing: What was Quicken Loans Thinking? Borrowers can give lenders easier access to bank information – this is one of those wiz bang promises we always see with new technology (assuming this product is new technology). But I don’t think anyone is arguing to keep the process arduous. Approvals might be less prone to human error. – Sure, that’s entirely possible although this argument is like saying if there was less air pollution we might all feel better. We would have to assume that borrower data entry is better and it matches up to official documents like tax returns and pay stubs – something that was not a lender concern in the last cycle. Automation may ease tight credit. That’s another one of those wiz bang assumptions that any technology gain – automation is better – remove humans and the process gets easier (again, we don’t understand what the details are of this wiz bang new technology). EZ Pass scanning technology on the highway is far better for toll collecting but it took a few decades to perfect. The mortgage lending process is full of judgments that need to be made and common sense has been removed from the mortgage underwriting process so it can be completed with checkboxes. I contend that automation will NOT ease credit any time soon because automation means a series of lending rules and it will take years to iron out. It may even delay credit normalization as lenders are reluctant to fully trust it. Plus lending continues to remain tight because of bad decisions made in the past and a weak outlook for the future (30 year fixed is below the level just before the December Fed rate hike), not because the process needs to be more efficient. Mortgage origination volume has fallen nearly every year since 2006 so I can’t see lack of automation as holding back the normalization of credit. Digital lending is here to stay. No one is really arguing against digital lending per se. The future across most industries is digital and that transition can be good and bad. The mortgage process is much more digitized than it was a decade ago so disagreeing with the Rocket Mortgage message doesn’t make someone anti-digital. Make a complex process easier for qualified buyers. Of course! If that is what is actually being delivered. It’s a black box and the consumer is getting their information from a commercial that conveys dated message. If David gave a speech in a 1970s era polyester suit with bellbottoms, would his current information leave the audience with a current market impression? The real reason for the pushback on this rocket thing is not because we are anti-digital, anti-efficiency, anti-credit easing, anti-automation or anti-polyester bellbottoms. The pushback comes from the messenger being the second largest mortgage lender in the U.S. who marketed their product seemingly devoid of any understanding of the housing bubble, which after all, was really a credit bubble. And it becomes even more clear to me as an appraiser, looking at their complete reliance on appraisal management companies and how awfully unreliable that post-financial crisis industry really is at estimating collateral, that their judgment is flawed in the long run. The same sort of promises and expectations were made during the run up of Countrywide Mortgage. We are nearly 9 years down the road from the 2007 implosion of American Home Mortgage and those 2 Bear Stearns mortgage hedge funds and yet economically, the world is still in the hangover stage. Please watch that commercial again. Read my latest Bloomberg View column Want a House? Good Luck With the Down Payment. This post also went #1 on the Bloomberg Terminal and on the public facing BloombergView.com site for 2 days. Super crazy. 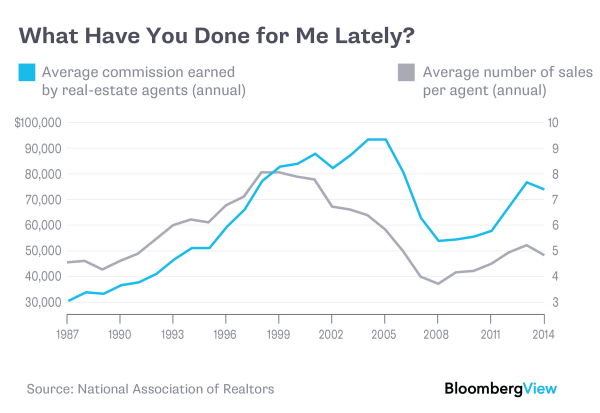 Read my latest Bloomberg View column Real-Estate Agents Ride High Again. It was disappointing to have so many Realtors go on the attack over this piece showing they missed the entire point – I was writing about the trend, not the dollars or the splits. Are commission incomes higher in say Manhattan than in rural Texas. Doh! The very idea that incomes are rising after years of low transaction volume plus the lack of resurgence in NAR membership since the financial crisis has made for a little less competition today. This seems like good news to me for the industry. But with the barrier to entry so low, the window will close sooner than later. I even had a PR executive at NAR send me a critical email concerning my numerical calculations and results but made the mistake of exposing her significant lack of understanding about what data NAR actually publishes. To avoid embarrassing her I opted not to share the letter in this post. Leigh Kamping-Carder over at Brick Underground put together a pretty cool infographic that covers the sales process of a NYC apartment. 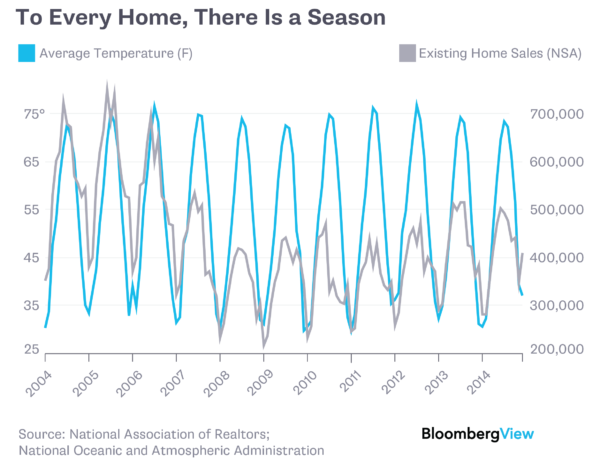 Read my latest Bloomberg View column Housing Market Blows Hot and Cold. …and the Home Seller will give you a Free Tesla! Back when I was in college, a good friend of mine owned a large Michigan sod farm with his father – acres and acres of putting green quality sod. They wanted to upgrade their big tractor so I joined him on his visit to the local tractor dealership – International Harvester (my parents tell me I am a distant – really distant – relative of John Deere). The tractor they were looking at included air conditioning and a surround sound stereo system. It was impressive. 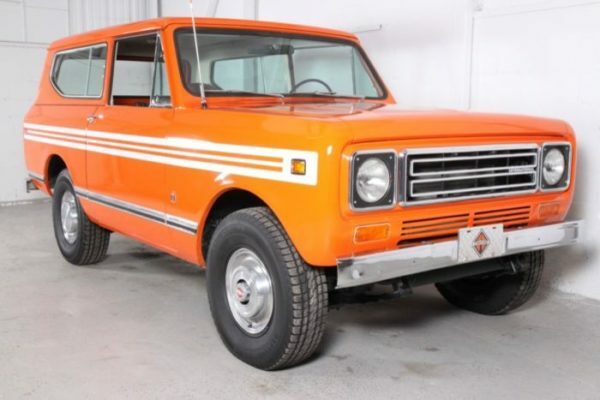 The salesman said that if they bought the tractor that month the dealership would throw in an International Harvester truck. Jhoanna Robeledo’s New York Magazine piece on the guy who throws in a Tesla if you buy his condo talks about this marketing technique. Using a Tesla is buzz worthy as a well thought of brand – after all marketing is about getting eyeballs on the listing – but is it effective? Does this technique actual sell properties? Econ 101: There is no such thing as a free lunch. We’ve seen this marketing gimmick attempted with other cars such as a Prius, a Porsche, a Cadillac and Ferrari. The funny thing is, you never read a follow-up article that shows how this marketing technique/gimmick was successful. A buyer for the condo in Jhoanna’s article would have the financial wherewithal to buy their own Tesla and likely isn’t thinking about buying a car during their visit to the property. We don’t see these extreme marketing gimmicks tried with low margin properties. “If I buy this $75,000 condo I get a free Tesla!” Of course not – the condo seller in this “Tesla” story is telegraphing to a potential buyer the listing is over priced. 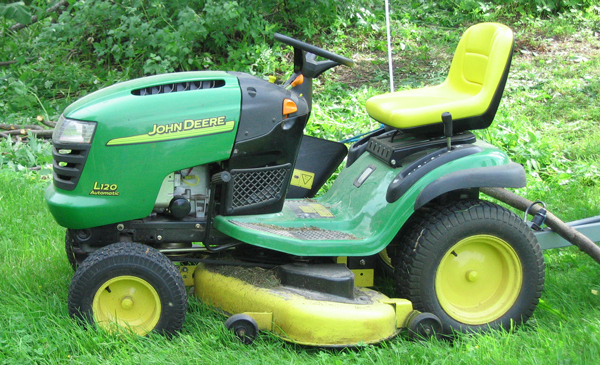 Yes, in a typical suburban transaction, a seller may throw in a used lawnmower to close the sale, but this is not something that is usually promoted during the actual marketing of the property. NEWSFLASH Buyers are a lot smarter than this Tesla-giving away seller is giving them given credit for. Joe Weisenthal, Executive Editor of Business Insider, pronounced we’re at “Peak Anti-Homeownership” after reading Barry Ritholtz’ Bloomberg View piece on homeownership a few weeks ago. If financial journalists and housing pundits today truly reflect the US sentiment about housing and homeownership, then we’re clearly manic about our largest asset class. The conversation by a number of financial journalists and a particular Nobel Prize winning economist has morphed into a homeownership-is-a-false-aspiration pronouncement, almost entirely supported by treating this asset class as a stock. Didn’t we learn the hard way that this was flawed thinking during the prior boom? And unless I’m mistaken, the majority of US homebuyers, aside from investors, used leverage for much of the last 50 years. How about we estimate the ROI on what real people actually do and stop thinking about homeownership as a stock transaction? Good grief. 2012-2013 – Last year’s housing market “recovery” pronouncement was based on nothing fundamental, merely Fed policy of QE and years of pent-up demand released after the “fiscal cliff” came and went without a major catastrophe. Pundits caught up in the price euphoria said the housing market was firing on all cylinders. Yet surging price growth was largely based on sales mix-shifting, less distressed sale buying, tight credit causing, lack of inventory inducing, fear of rate rising, double-digit price growth. Positive housing news was refreshing news to many, but there was nothing fundamental driving the market’s performance to such incredible rates of growth. I couldn’t wrap my arms around 13% price growth with tight credit, stagnant income growth and unacceptably high under-unemployment as economic fundamentals. 2014 – This year’s housing market, which is being compared to the year ago frenzy, is showing weaker results. The housing recovery “stall” is being blamed on the weather, falling affordability and weaker first time buyer activity. 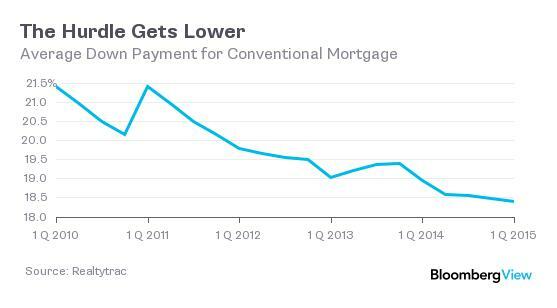 This has brought some in the financial media to conclude that homeownership is over rated. An aside about the weather – a homebuyer last January didn’t say “Gee, since it is 0 degrees outside, let’s cancel our appointment with the real estate agent and delay our home buying plans for 5 years.” Of course not – the harsh weather merely delayed the market for a month or two. However since it hasn’t “sprung back” yet, then clearly there is something else going on besides the weather. Falling homeownership and anemic household formation is the result of a lackluster economy and a global credit crisis hangover. I can’t make the connection how these weaker metrics have anything to do with a flaw in the homeownership aspiration. Homeownership is falling because it rose to artificial highs (Fannie Mae was shooting for 75% during the housing boom) and is now overcorrecting because credit is unusually tight, the byproduct of a lackluster economy, the legacy of terrible lending decisions and fear over additional forced buybacks of flawed mortgages among other reasons. I’m quite confident that a significant, sustained economic recovery will go a long way to ease credit conditions and eventually revert homeownership to the mean and we can stop with the “cart before the horse” orientation. While homeownership has never been right for everyone, recent calls that it’s not right for anybody is just as flawed. Then we’ll pronounce “Peak-Homeownership” in our own manic way. Sellers and their real estate brokers are more focused on the qualifications of the buyer than ever before. “Flexibility of terms,” “limited contingencies,” and “paying with cash” have become well-used phrases in the current home-buying process. 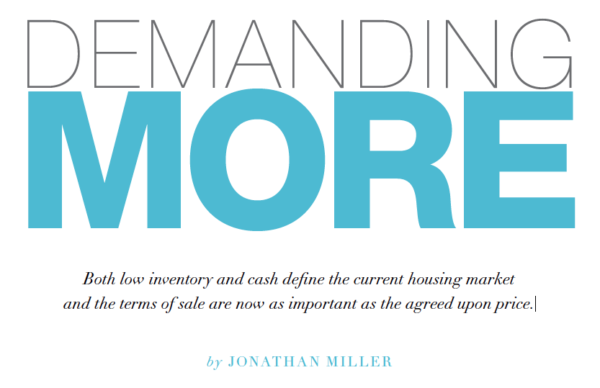 Here’s an article I penned for the current issue of Elliman Magazine. It’s about the concept that the terms of a sale are now just as important as the price. The latest issue of Elliman Magazine, including my article, as well as the most recent market reports we author are available in the Elliman App. 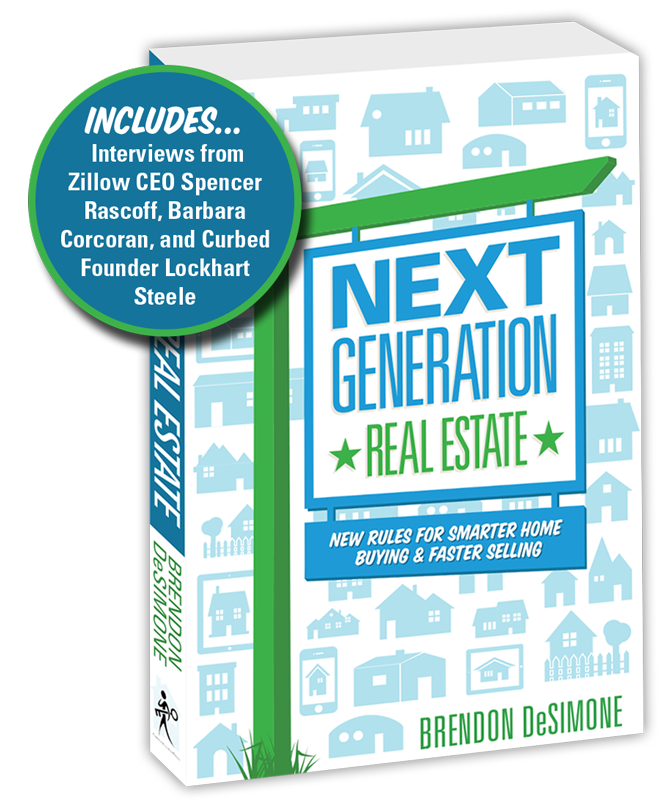 My friend Brendon DeSimone has penned a tome on today’s relevant issues in the home buying and home selling process. Yes, there are a lot of real estate “how to” books out there, but his presentation is refreshingly straightforward. 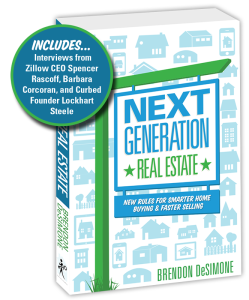 He provides a slew of tips from well regarded people in various walks of real estate life. Even better, Brendan allowed me to rant about the current state of the appraisal industry and how buyers and sellers can navigate through the process in today’s challenging and confusing market conditions. Saw this visual over at Business Insider that shows how communication patterns differ around the world – from Richard D. Lewis’s book “When Cultures Collide“. I haven’t read the Lewis book yet but I’ve always been fascinated by the topic of communication and linguistics – another book got me interested in the topic: That’s Not What I Meant! : How Conversational Style Makes or Breaks Your Relations with Others by Deborah Tannen circa 1992. I’ve read it three times. 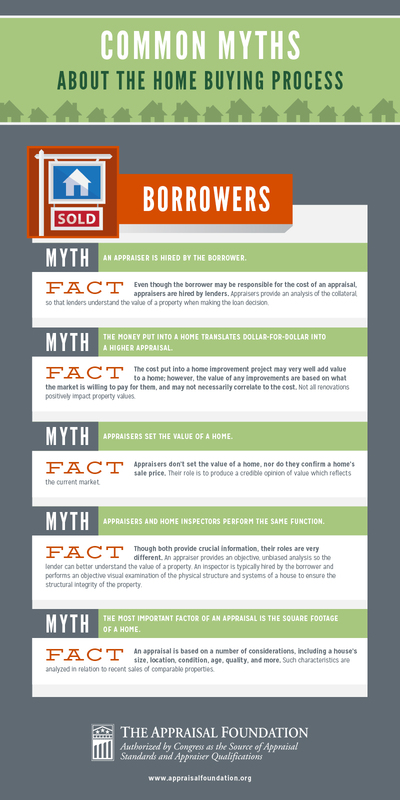 The Appraisal Foundation published an appraisal infographic that attempts to clarify common misconceptions by the borrowers about the appraiser’s role in the home buying process. The content is amazingly simplistic, but that’s the point. I continue to be amazed at how so few people don’t understand what the appraiser’s role is in the home buying process. Perhaps this is why the appraisal industry continues to be marginalized in the lending process (ie appraisal management companies, Appraiser Independence Requirements) and the exodus of competent appraisers into other disciplines outside of residential mortgages continues.